The Village at Reflection Lake Nantahala offers luxurious vacation homes near the pristine Lake Nantahala in North Carolina. 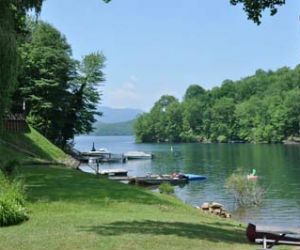 All home sites have incredible lake and mountain views. Home sites are priced from $94,900 to $129,000 and are built custom made. With no build-out requirement, buyers can take their time planning their dream vacation homes. Homes are located in a private gate community with many upscale amenities, besides the gorgeous views. Visit soon, the promotion ends September 30! Reflection is a tranquil retreat that is easily accessible from Atlanta, Chattanooga, Charlotte, Greenville and many other metropolitan areas. Buy today, and enjoy each season in your dream vacation home! For more information, call 866-218-8439 or visit www.lakenantahalareflection.com/thevillage.